Over the last few weeks, we’ve identified how to execute an employee assessment by focusing on the Attitude, Independence and Manageability Behavior sections of the Profiles Sales Assessment Concurrent Performance Model Overview, We now wish to Focus on the Assertiveness Behavior to provide us with another excellent example of how to use this report to optimally execute and create a tension free environment for your audience. Assertiveness measures an individual’s desire and interest in putting themselves in a leadership situation and gives a strong indication on the primary style of leadership that would most likely be utilized. People with scores on the right have a strong interest in leading and being in charge whenever they ae involved with a group or project. Typically, their style of leadership would revolve around a controlling, more directive approach. People on the left do not have a strong desire to control others and are very willing to accept others in leadership roles. When left oriented people find themselves in a leadership role their style typically is more diplomatic and consensus oriented. As you can see in our team example, 11 of the 12 Team members and the leader have scores entirely in the balanced area of the Bell Curve which is where the majority of people would score. This is quite a different perspective than the other Behavior sections we’ve written about in previous blog posts on this topic! 6 Team members plus the leader have scores of 6 or 7 and 1 person is a 10. These people would be more focused on achievement and seeking leadership and control of situations. 5 Team members have a score of 4 and 5. These scores suggest a minimal need to control the actions of others and may be perceived by other team members as compliant and consensus oriented. 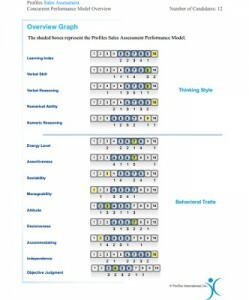 Because this team has such similar scores, the assertive behavior would not likely cause much tension within this team allowing for optimum execution with minimal stretching outside their comfort zones.The leader may benefit from our Leadership Charisma case study in order to increase their ability to motivate. By having this type of report available, the leader can understand that his/her team has a very balanced perspective on the assertiveness behavior. He/she can offer leadership opportunities depending on individual levels of interest within the team. The Profile PXT Team and Executive reports Leadership tools would be great for this leader. This team would utilize a blend of leadership styles ranging from diplomatic to directive depending on the situational requirement.